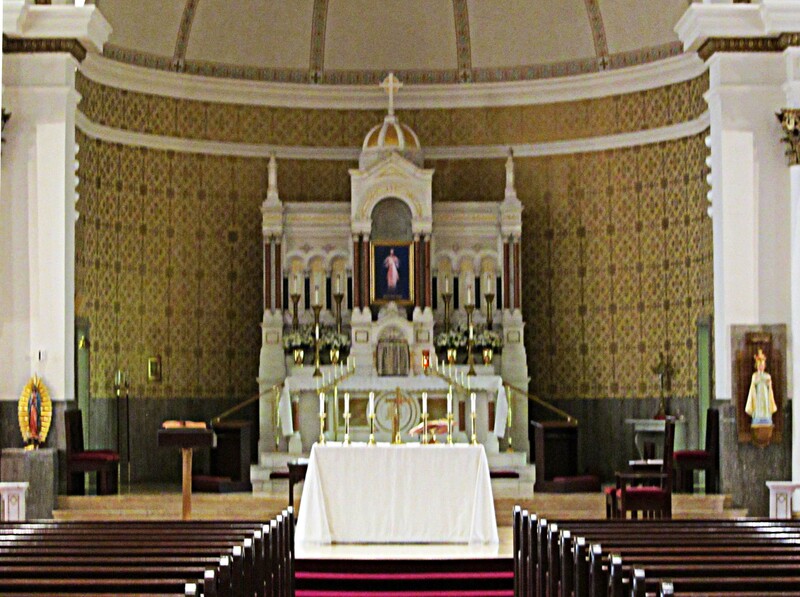 (This is also the Diocesan shrine of St. Faustina and the Divine Mercy). Remember you can always enlarge an image simply by “clicking” on it. 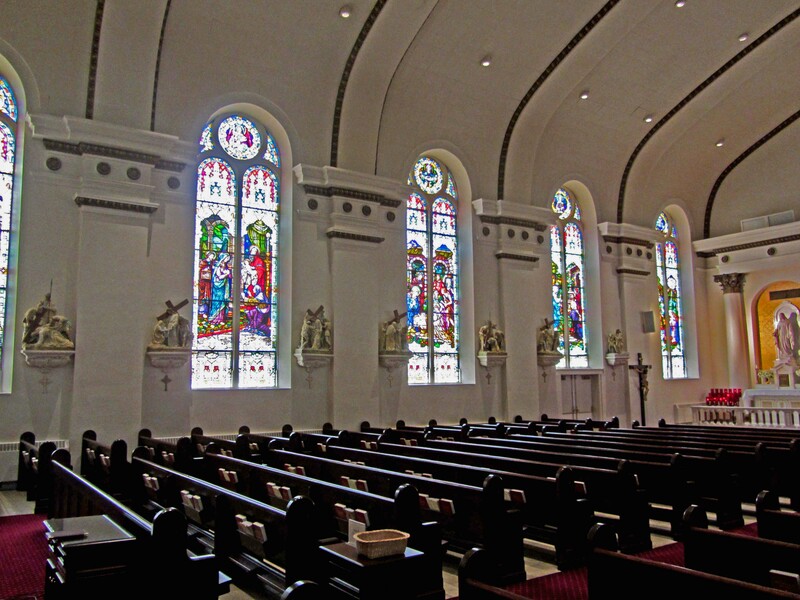 Our Lady of Good Counsel Church traces its history back to 1866, when Fr. Bernard Donnelly constructed a log cabin church on the property which the current church still occupies today. As population in the area known as Westport and the surrounding Kansas City grew by the late 1800’s, the need for a larger church to serve the growing population led to the building of the current church. The corner-stone was laid in 1906, and Our Lady of Good Counsel Church was formally dedicated about a year and one-half later. The church has seen many renovations over the years. The interior walls and the area over the apse had been decorated with beautiful paintings and stenciled designs by Dante Cosentino. A recent “modernization” brightened up the church interior, but Cosentino’s lovely and distinctive paintings from earlier years have been lost. However, the altar from the original church remains. 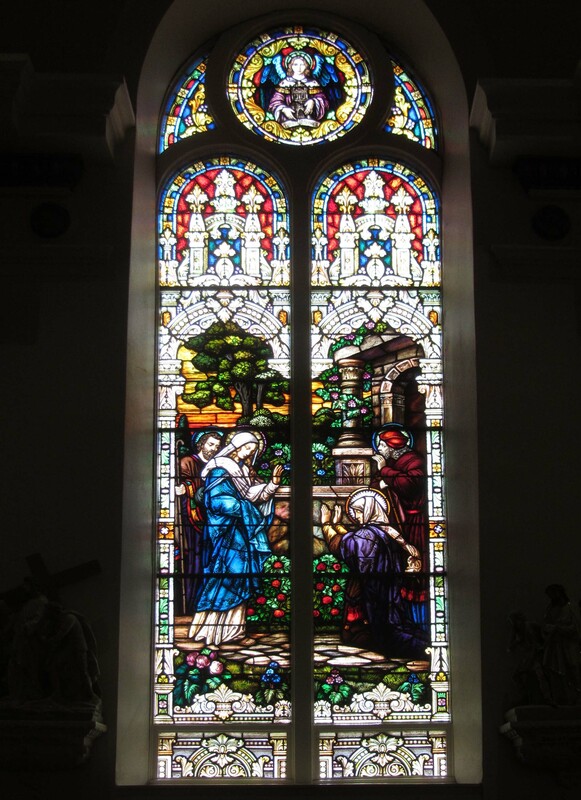 Of course, the widows in the church are still glorious. The richness of design as well as the range and subtlety of colors is stunning. Unfortunately, as of this date, I have not been able to learn anything about the source of the windows: the glass, the designers, the painters, or the fabricators. There are no memorial dedications for any of these windows. The entrance to the church faces the east. The altar sits in a half-domed apse at the west end of the nave. The north and south walls each hold five large windows based on the life and ministry of Jesus. Each window is comprised of two “lights” with a round medallion above which relates to the theme of the pair of windows beneath. 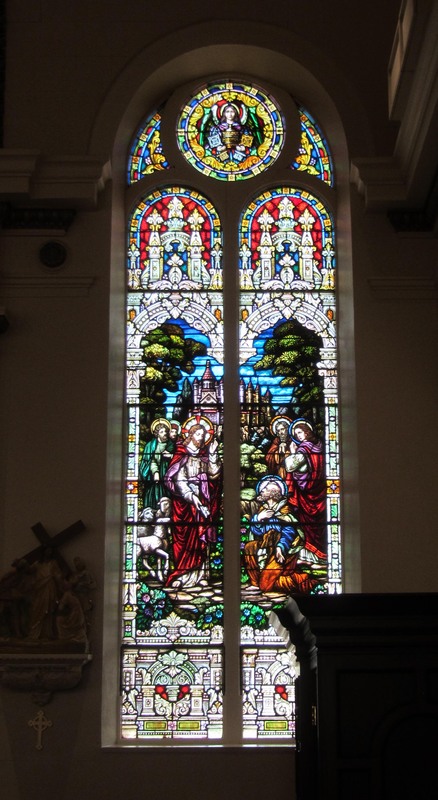 Each of the individual windows of the pair has an architectural framework situated below and above the scriptural scene, as well as a border. 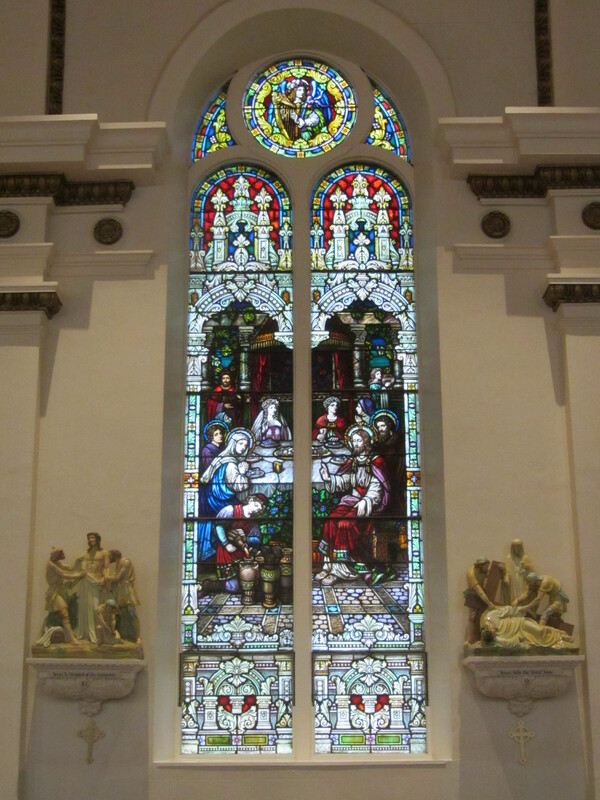 Moving from the front of the church toward the rear, the first window on the south wall depicts the Annunciation, the first Joyful Mystery of the Rosary. Here the Angel Gabriel appears in human form to Mary as she prays, announcing “Hail, full of Grace! The Lord is with thee.” (Luke 1:26 -38) Gabriel carries white lilies in his hand which are symbols of Mary’s purity. Above Mary a dove radiates the Holy Spirit. The angel informs Mary that she will conceive by the power of the Holy Spirit and her Son will be called the Son of God. Mary answers “Behold the handmaid of the Lord. Be it done unto me according to your word.” On the ground are roses, also symbols of Mary’s purity and foreshadowing the blood of the passion and of Christian martyrs. 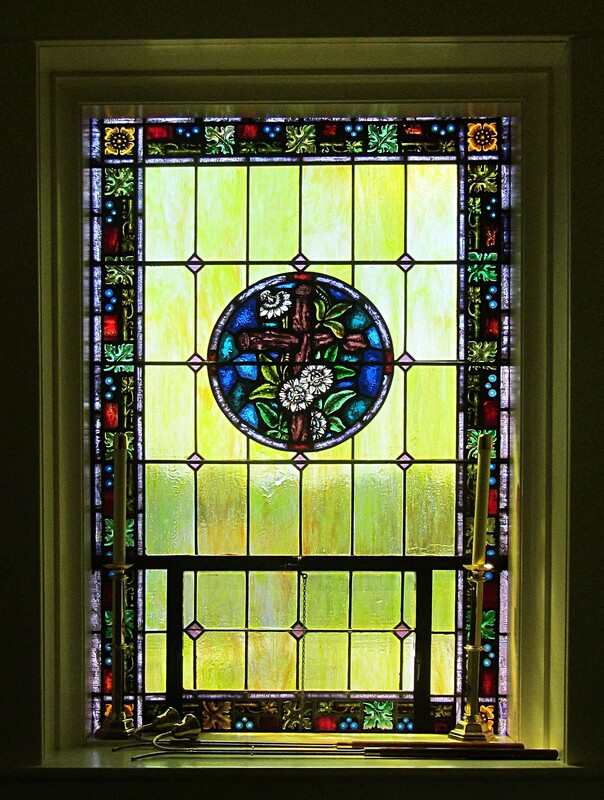 The medallion above this window includes an image of God the Father. 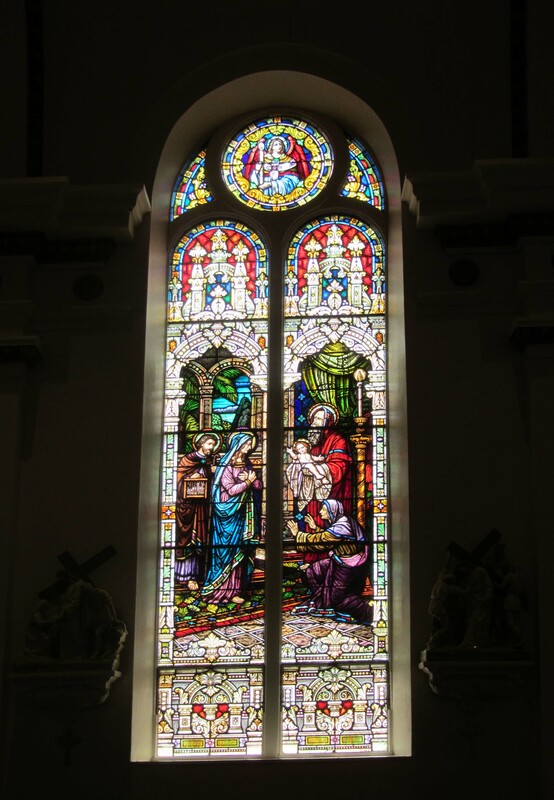 The next window depicts what Catholic tradition refers to as the Second Joyful Mystery of the Rosary. It is the Visitation of Mary with her kinswoman (cousin) Elizabeth, who is to give birth to the child who will be known as John the Baptist. As they greet each other, Elizabeth exclaims “Blessed are you among women, and blessed is the fruit of your womb.” (Luke 1:39-56) Mary replies with the Magnificat ” My soul glorifies the Lord…” (Luke 1:46-55) In the medallion above this scene an angel holds the Tower of David (Turris Davidica) referencing the descent of Jesus from King David. The Fourth Joyful Mystery of the Rosary, The Presentation, is depicted in the next window. Here we see Mary and Joseph bringing the Christ child to the Temple as part of the traditional consecration of the first born son. ( Luke 2: 22-40) The child was consecrated to the Lord and the parents made a sacrifice to redeem him. If parents were too poor to offer a lamb, two doves were accepted in its place. Here we see Joseph carrying the doves in a cage to be offered as the sacrifice. Mary again is dressed in her blue gown, a symbol of her purity. We also see the prophet Simeon holding the child and declaring that he (Simeon) now may die because he has witnessed salvation in the person of the child, Jesus. Kneeling beside Simeon is the old woman, Anna, a prophetess in her own right. In the medallion above this scene, an angel holds the Light of Christ. 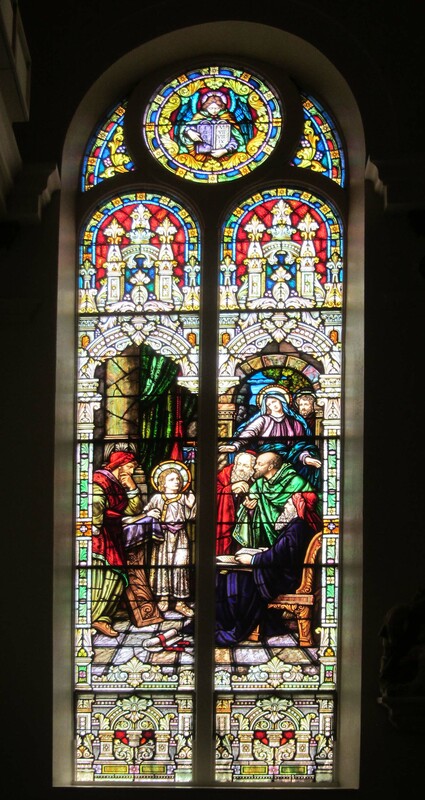 The next window depicts the twelve-year old Jesus preaching/teaching to the elders in the Temple. This is the Fifth Joyful Mystery of the Rosary. When his parents inquire as to why he was preaching in the Temple, Jesus replies “I must be about my Father’s business.” (Luke 2:41-50) In the medallion above this scene, an angel holds the tablets with the Ten Commandments. This is the last large window on the south wall. Two small windows are above the altar in the side wall of the apse. Above the doors in the entryway are three narrow, horizontal windows. The northern one displays the “IHS” monogram for the name of Jesus based on the first three Greek letters of His name. In the center are the crossed gold and silver keys of the Papal seal. 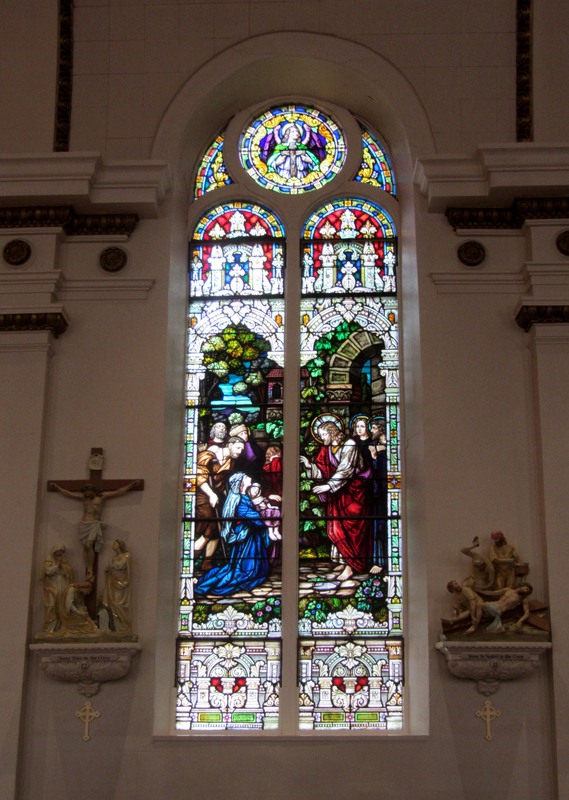 On the south window is a cross within a crown. On the north wall starting at the back of the nave, is a window depicting the moment Jesus gives the key to Peter saying “I will give you the keys to the kingdom of heaven.” (Matt 16:19) In the medallion above this scene is an angel holding the crossed silver and gold keys and the three-tiered tiara which symbolize the papacy and its authority. 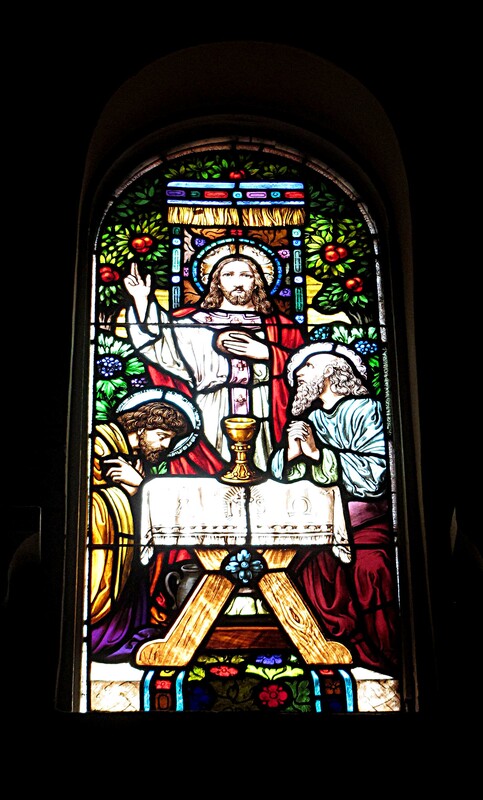 The next window, moving toward the altar, depicts the Wedding Feast in Cana where Jesus performed the miracle of turning the water into wine. (John 2:1-11) . 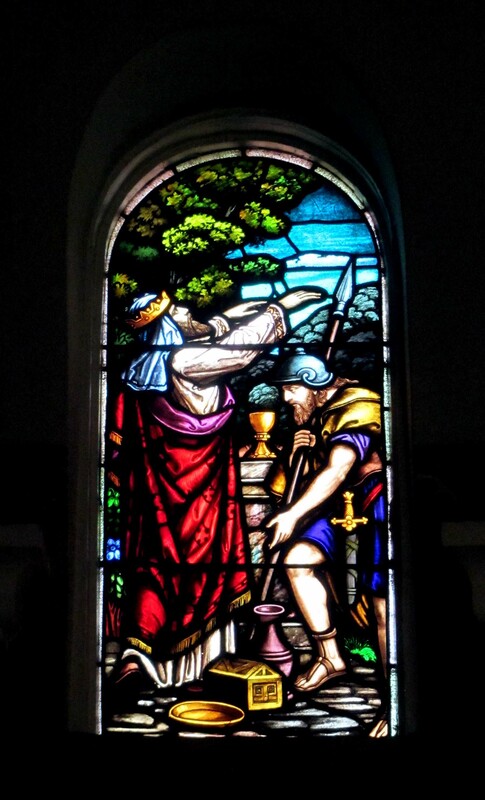 In this window we see John looking out to us as Jesus instructs the boy pouring the water/wine into the jars. 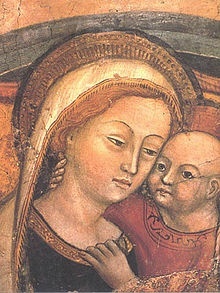 Mary and Jesus sit closest to the viewer. The bride and bride-groom sit at the head of the table in the center. The angel in the medallion plays a harp, providing music for the festive wedding and perhaps for all festive celebrations. In the next window we witness Jesus healing a sick (dead?) child. ( Matt 9:35 etc. ; Luke 7:21 ) The lame and blind stand by. Two of Jesus’ disciples stand beside Him. The angel in the medallion holds a crucifix, symbolizing His victory over sin and death. 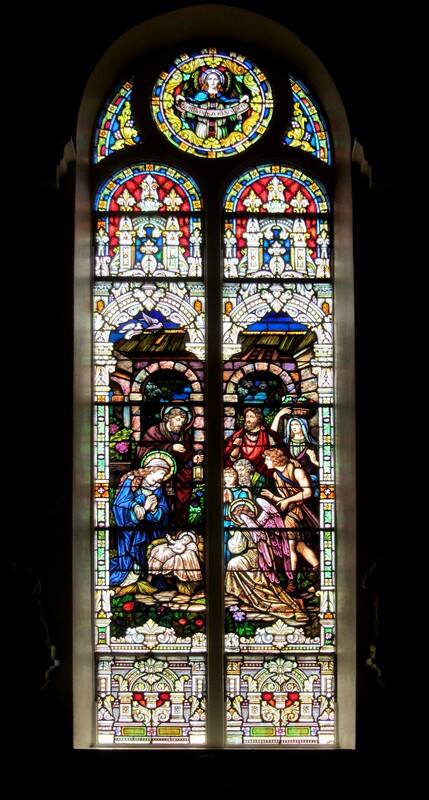 The next window shows Jesus surrounded by children and their mothers whom he is blessing. He says “Bring the children to me for the kingdom of heaven belongs to such as these.” (Matt 19:14; Luke 18:16) In the medallion above this scene, an angel holds lilies and doves symbolizing The Holy Spirit. Just off the entry vestibule is a small room or chapel with two windows. One depicts the sea shell of St. John, the other a lamb with a banner which says Ecce Agnus Dei (This is the Lamb of God). Windows in the two vestries just off the apse are comprised of soft, golden colored glass with a geometric and floral border of leaves. 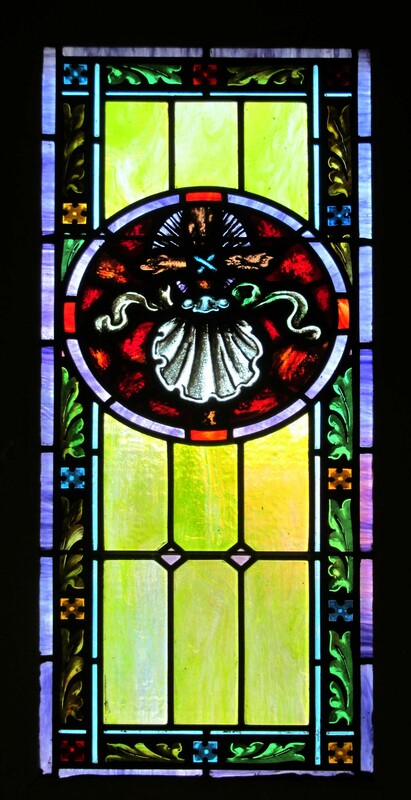 One window has a central medallion with a cross encircled with white blossoms. 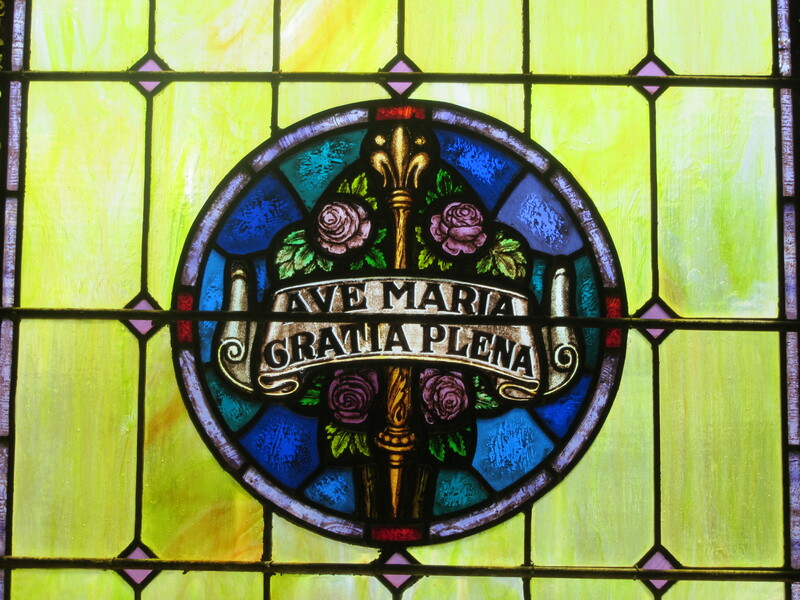 The other window shows a staff with roses and a banner with the words Ave Maria Gratia Plena. 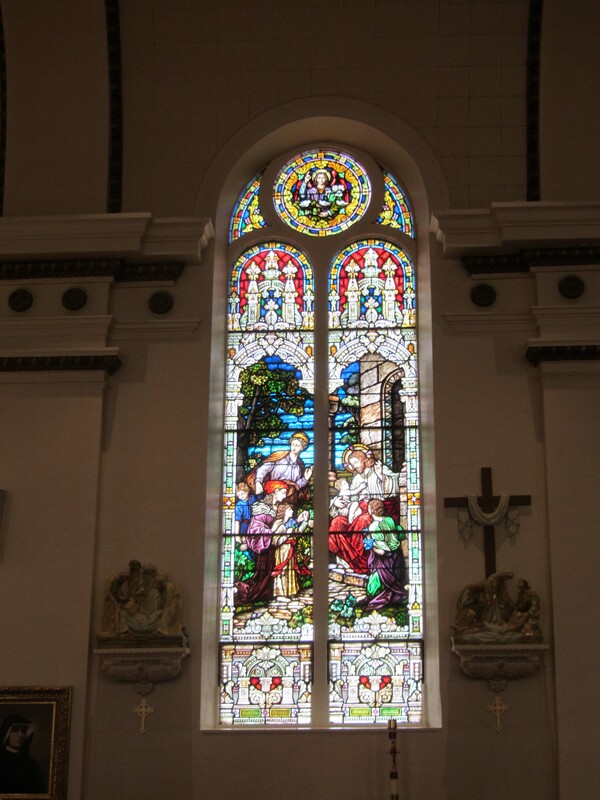 Two additional windows are located in the back of the choir/organ loft. 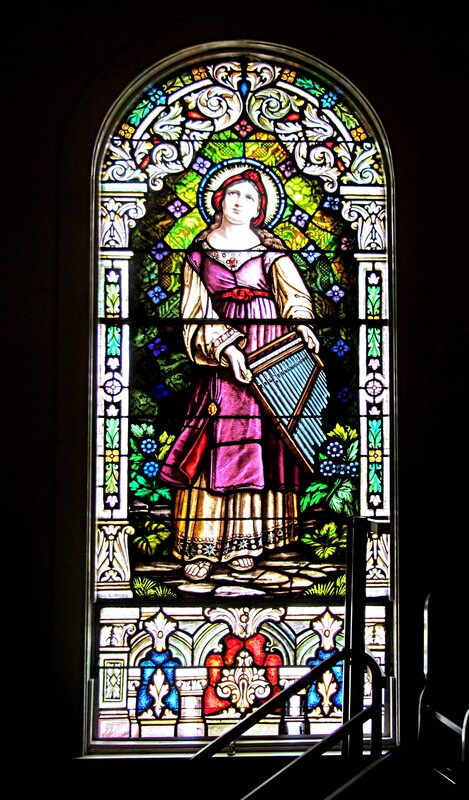 One quite fittingly is of St. Cecelia, the patron saint of music. She is holding her small organ and is surrounded by flowers with a radiant glow behind her. 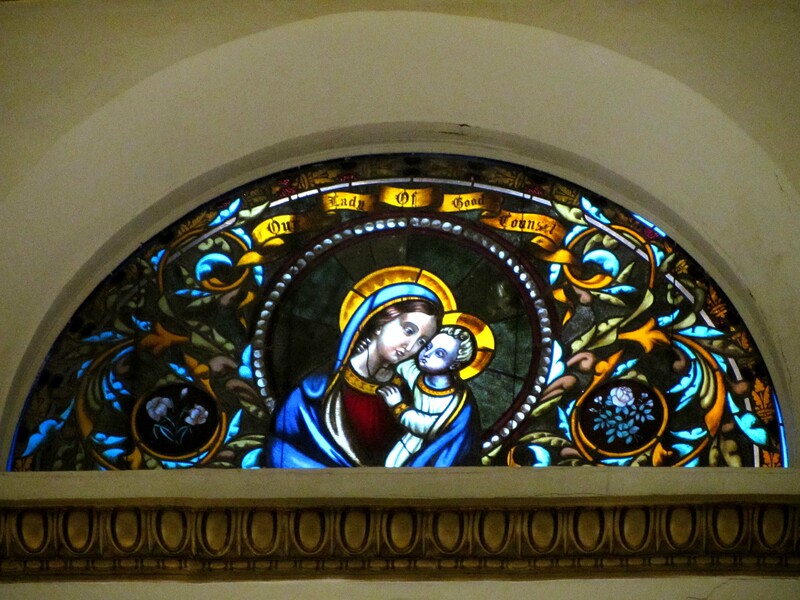 One final note about Our Lady of Good Counsel Church. 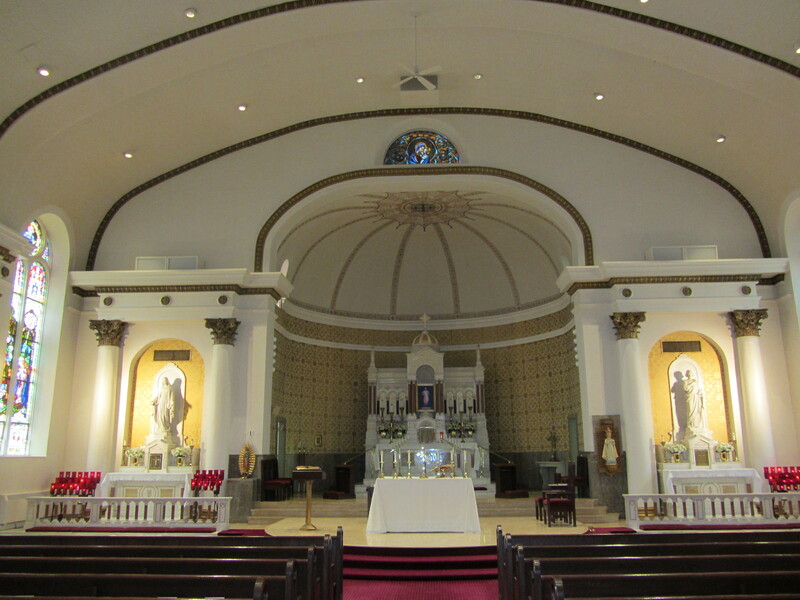 It is also the Diocesan shrine of St. Faustina and the Divine Mercy. In the 1930’s Sr. Maria Faustina Kowalska, an uneducated nun living in Poland, wrote a diary of 600 pages recording revelations she was receiving about God’s mercy. She was called to religious life following a vision of the suffering Christ and in 1925 entered the Congregation of the Sisters of Our Lady of Mercy. She died in Cracow in 1938 at the age of 33. Pope John Paul II beatified her in 1993 and she was canonized in 2000. Santa Maria was the name given to a small church erected in the 5th century on the ruins of a temple of Venus in what is now the town of Genazzano, about 30 miles from Rome. The Augustinian friars were charged with its care and restoration in 1356. According to the legend, this small church stood unfinished and roofless until April 25, 1467 when, on the Feast of St. Mark, the image of the Madonna was miraculously transported into this church from its former home in a church in Sculatori, Albania. On the day of the feast, the people heard sweet music in the air and a soft cloud settled over the church. When the cloud lifted, the image of the Madonna and Child mysteriously appeared on the wall. The “miraculous” picture has been in the reverent keeping of the Order of Saint Augustine for over 400 years. Restoration of the fresco in 1957-59 suggests that the image was once part of a larger fresco that had been plastered over at some time before 1467. The experts believe that it was painted by an early 15th century artist by the name of Gentile da Fabriano sometime between 1417-1431. The unexpected appearance of the image probably occurred when a ledge was being inserted into the wall. Most likely, the plaster cracked and fell away, revealing the fresco beneath. Over the years the small church and its mysteriously appearing image of the Madonna and Child has become a center of pilgrimage and of many reported cures that have been attributed to its power (and of course to Our Lady of Good Counsel) . Or you can always go to the ‘Page” from one of the “Church” menus. Remember, you can always enlarge any image simply by “clicking” on it. This entry was posted in Uncategorized and tagged Annunciation, Apostles, Children, Garden, Healing, keys, Last Supper, Magdalene, Mary, Nativity, Peter, St. Cecelia, Temple, Visitation, Wedding at Cana. Bookmark the permalink. I’m fairly certain the mystery king is sleepwalking…..
Great. I hadn’t considered that. The other choir loft image is Pope Gregory the Great, creator of “Gregorian Chant”. He is wearing the Papal Tiara, has the papal glove on his right hand, and is holding a book of chant. He’s also wearing some really snazzy red slippers….I am a member of this parish, by the way…. John, thanks so much for your help. I will make the needed changes in the blog. 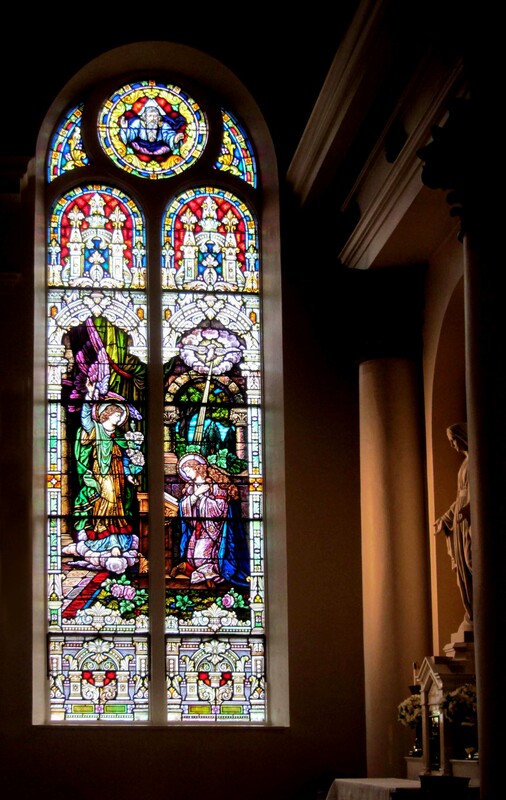 I hope you “follow” the blog as I enter more windows from Kansas city churches.